Photo by Melissa Tso. Graphic by Vanessa Bowen. 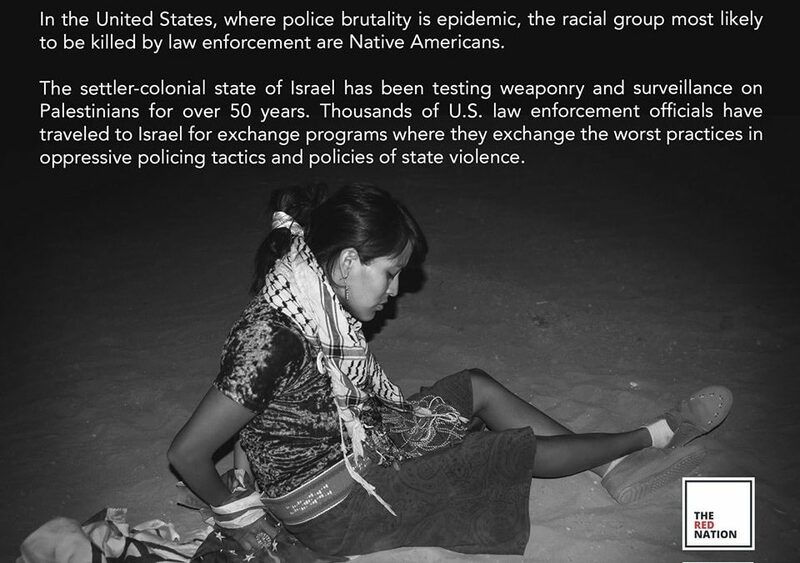 Statement:Melissa Tso, a lead organizer with The Red Nation and advisor to the JVP Deadly Exchange campaign, interprets the mass injustice and incarceration of imperialist police forces, experienced by Indigenous peoples of Palestine and North America. For more than 50 years, the settler-colonial state of Israel has been marketing weaponry and surveillance, testing on Palestinians every day in the occupied territories. Israeli companies unabashedly share that they have actual experience and have tested their weapons on human beings. Because of their advancements in surveillance and policing technology, Israel makes billions of dollars on weapons exports — and the United States has even sought opportunities to learn from them. For example, pro-Israel companies promote and fund police exchange programs between the United States and Israel. Thousands of law enforcement officials from the United States have gone to Israel to learn policing and surveillance practices–these are worst practices that easily translate to police violence. What happens when two dangerous settler-colonial states combine forces in this manner? The result can only be increased discriminatory practices and new methods of erasure to wipe out Indigenous peoples by racist police forces of the state. For Natives in the United States, deadly exchange programs have become another imminent threat, since they are the racial group most likely to be killed by law enforcement. Natives have already become the target of epidemic police brutality in the United States due to rampant racism and discriminatory policing. If Israeli security forces are committing human rights violations against Palestinians every day and becoming insensitive to the violence they inflict, what will become of Natives policed by law enforcement officials learning from Israeli security forces? As these settler states continue to commit ongoing acts of genocide, removal, and dispossession, solidarity between Natives and Palestinians is crucial to combat the state violence on their own homelands. We need to only look to Standing Rock to see how militarized police are still the primary tool for colonial dispossession. We’ve also seen a strong Palestinian presence in Standing Rock as several delegations traveled from afar to stand in solidarity with a people who share their struggle. We’ve seen Palestinian activists share tear gas advice with Black Lives Matter protestors in Ferguson. There lies immense and genuine potential in the unity of oppressed peoples from across the world fighting the same struggle. Jewish Voice for Peace (JVP) launched the Deadly Exchange campaign this year to demand an end to police exchange programs between the United States and Israel, emphasizing how their relationship promotes worst practices like “racial profiling, mass surveillance, police shootings, and violent suppression of political dissent.” JVP educates how repressive policing exists in both Israel and the United States: extrajudicial executions, shoot-to-kill policies, police murders, racial profiling, massive spying and surveillance, deportation and detention, and attacks on human rights defenders. In protest of the deadly exchange between New York Police Department and Israeli security forces, on June 4, 2017, Jewish Voice for Peace allied with IfNotNow to disrupt the annual Celebrate Israel parade in New York. Over 100 activists participated and seven were arrested (five were LGBTQ Jewish protestors) as they blocked progress of the parade and staged sit-ins. JVP advises that a genuine safety for all should be achieved and grown through building joint struggles for justice, NOT POLICING! As protectors of Indigenous life and land, The Red Nation stands in solidarity with the Palestinian struggle. We endorse the Deadly Exchange Program, a campaign by Jewish Voice for Peace. To take action with the campaign, visit deadlyexchange.org/take-action/.